Inner State Gallery is proud to present two solo shows in celebration of Detroit’s electronic music heritage. 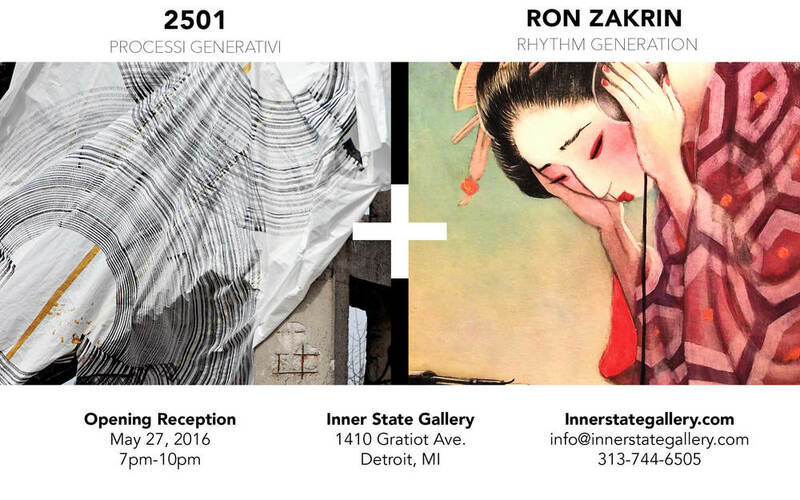 Detroit-based artist Ron Zakrin returns for his second solo show "Rhythm Generation" alongside Italian artist 2501 who will present "Processi Generativi." Both artists share a passion for electronic music and each collection of new work will represent their visual interpretations of the music genre. Join us for the artist reception from 7-10pm on Friday May, 27th. This exhibition is free and open to the public. For additional information or availability, please email info@innerstategallery.com or call 313-744-6505. Monotype on Arches Cover White 270g. Ink on Cotton Dozio Paper, Mounted on Zerkal 600g. 13" x 16" x 8"
35" x 8" x 13"
8" x 12.5" x 9"